What is happening in Great Britain today? Traditional tea rooms are on the decline while lattés, caramelattés, cappuchinos, mochachinos and espresso drinking cafés are on the upswing. The new millenials would rather log on and slurp, than clink cups and sip. Although people are living longer, older generation Brits just can’t seem to hold onto their dying traditions anymore. The solid foundations are slipping away. The special occasion “afternoon tea” may be as popular as ever, but the mid-morning, mid-day, early evening tea break is just about gone. Now there appears to be a war between Caffé Nero, Starbucks and Costa. Take away their signs and all the marketing materials, and quite honestly, they are impossible to tell apart. No character. No charm. No unique identity. They refer to themselves as “customer centric”? What exactly does “customer centric” mean anyway? They each use surveys to track the customer service experience. Surveys from how the customers like the furniture, the music, the art, and most recently what was printed on the take-away cup. What about a survey about how good the coffee or tea tastes? I guess that’s no longer important. And the media tells me everyone is so concerned about their calorie and sugar intake, yet many Brits now consume these beverages regularly. Action on Sugar, which is a group of specialists concerned with sugar intake and its effects on health, analyzed 131 hot drinks and found Starbucks, Caffé Nero and Costa to be among the worst offenders. At Starbucks a “White Chocolate Mocha Venti with Whipped Cream” has 18 teaspoons of sugar. Now, if I’m ordering dessert at a restaurant, that might be okay, but … really … this is just a beverage? All right, that might seem a bit extreme. How about if we wanted one of their seasonal beverages, such as Starbuck’s seasonal Hot Mulled Fruit drinks? Would you believe 25 TEASPOONS of sugar! Or if you think a nice hot chai would warm you up, at Costa a Chai Latte has only 20 teaspoons of sugar. ONLY 20 TEASPOONS! 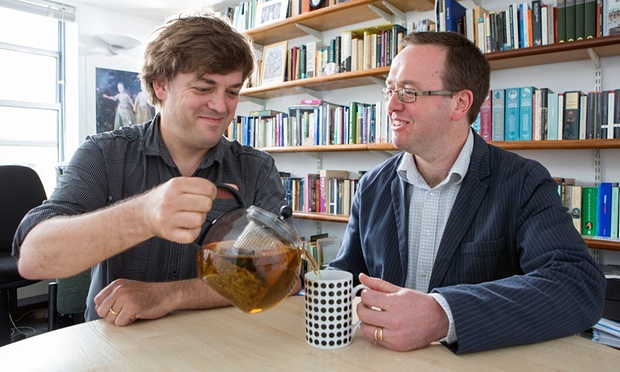 Want to know how many teaspoons of sugar are in a steaming, hot cup of tea? 0 Oh, maybe I didn’t stress that enough …. 0! If you want sugar, you can put it in yourself. I dare you to add 20 teaspoons of sugar to your cuppa and see if you still want to drink it. We might have to get into the cost of these highly-calorific beverages on another post, but, for now, just think of the calorie savings alone. The lowly cup of tea has 0 fat and 0 calories. You can still hold it in your hands. It still warms you. It tastes delicious. It is very social. What’s better than sharing a good pot of tea with friends? And it costs pennies. So c’mon Brits. Don’t be like so many other countries and let your traditions slip away. Does every shopping area need to look like every other shopping area and every café look like every other café? Perhaps tearooms may not be the chic, savvy trend-setting places they once were, but what they always have provided is a hearty cuppa, for a reasonable cost, warming the hearts and hands of generations of Brits! Does the Answer Lie in the Leaves? Last night I watched the first episode of Outlander. Yes, I know, where have I been the past year? I’m not quite sure if I’m going to like the series or not, but I must admit there was one scene which caught my attention … Claire and the minister’s assistant sitting in the kitchen having tea and then reading the tea leaves left in Claire’s cup. Tea leaf reading, or Tasseography (from the French tasse, for cup, and the Greek suffix graph, for writing), is the ancient art of predicting the future by reading images formed from the tea leaves left in the bottom of a teacup. The origins are a bit unclear. Was it the Chinese or was it Greek gypsies who saw the “future” in these images? What is clear is that you must be a bit of a mystic or clairvoyant to accurately interpret these images. By the 17th century, tea leaf reading had traveled, along with tea, up through Europe into Great Britain. “Tossing the cup” as it was called in Victorian England had become a very popular parlor game, but in Scotland, it was taken a little more seriously. One of the oldest books on the subject, TEA-CUP READING AND FORTUNE TELLING BY TEA LEAVES, was written anonymously by a Highland Scotsman. From the book, “… (reading tea leaves) is one of the most common forms of divination practised by the peasants of Scotland and by village fortune-tellers in all parts of this country.” Perhaps this is one of the reasons why the tea-leaf reading scene was included in the tv series. Before serving, stir the tea in the teapot and then pour a cup. You also must use a “proper” teacup with saucer – not a mug. The inside of the teacup must be white to see the leaves clearly and have sloping sides. The person who drinks the tea and wants to know the future is the “seeker”. The person who will read the leaves is, obviously, the “reader”. The seeker is asked by the reader to concentrate on what question she wants answered, or what she wants to know. After the seeker has finished the tea and left the dregs behind, the reader takes the cup in her left hand, and turns it counter-clockwise three times, swirling the dregs, and then turns the cup over onto the saucer. After a moment or two, the reader picks up the cup to see what images have been made by the tea leaves left in the cup. The interpretation of these symbols is, of course, based upon the talent and divining abilities of the reader. He or she must be intuitive, focused and creative. Seeing images in the tea leaves takes quite an imagination. The reader begins reading from the rim down. The rim signifies those events happening soonest, while the images closer to the bottom will be further in the future. The tea leaves which settle closer to the cup’s handle suggest home and family. Anchor: a good sign, symbolizing prosperity. Arrow: a disagreeable letter coming from the direction it points to. Bird: a flying bird indicates good news; a resting bird symbolizes an end to a journey. Boat: an upcoming journey or a removal of something from the seeker’s life. Circles: money, gifts or presents are expected. Clover: a very lucky sign; happiness and prosperity. Cross: a sign of trouble and delay or even death. Dog: a begging dog indicates someone will ask for a favor; a sad dog represents an injustice. Horse-shoe: a lucky journey or success in marriage and choosing a partner. Human: people in a positive stance is a good sign; aggressive stance signifies evil. Line: a straight, unbroken line means good progress; a broken line challenges the journey. Numbers: must be looked at with other symbols; numbers could signify days of the week, time, or amounts. Snake: spiteful enemies; bad luck; illness. Square: being boxed in, limited or oppressed. Sun, Moon, Stars: all signify happiness and success. Turtle: a slow but profitable journey. If you are interested in learning about tea-leaf reading, there are many books and websites on the subject. Tea-leaf reading teacups, with the symbols on the inside of the cup and on the saucers and an instruction booklet, are available for sale online and at book stores. Great fun if you want to have a tea leaf reading party at home. I’ve been to many tea rooms which offer Tasseography, as well as Tarot card reading, Palmestry and other forms of seeing into the future … all of which I find absolutely fascinating. Whether I believe it or not certainly doesn’t take away from my enjoyment of, not only the tea, but the experience. For a fun afternoon, I recommend visiting a tea room where they have Tasseographers and enjoying a little divination from the leaves. A “must” visit during our trip to Glasgow was the world-famous Willow Tea Room. I have to admit that I didn’t know much about the Willow then, just that I had to go. What I did know was this tearoom was designed by one of the most talented architects of the time, Charles Rennie Mackintosh, in 1903 in the futuristic “Arts and Crafts” style. What I didn’t know was the “back story” of how this tearoom, created by Kate Cranston and Charles Rennie Mackintosh, had become one of the most expensive and famous tearooms of Europe. Born in 1849, Catherine, or Kate as she was known, was the daughter of George Cranston, a successful Glasgow baker. George bought the then very popular hotel, the Edinburgh and Glasgow Railway Chop House and Commercial Lodgings. He renamed the hotel the Royal Horse, which then became known as Cranston’s Hotel and Dining Room. 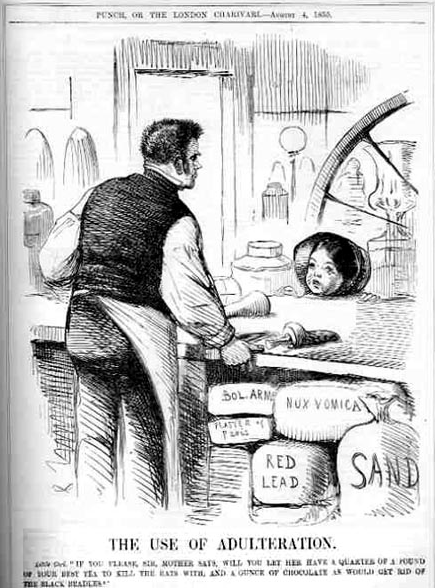 Glasgow at the turn of the century was riddled with problems … industries were closing, slums were prevalent, and overcrowding was a huge problem, followed by diseases like cholera and typhoid. Social centers were male dominated pubs serving coffee and ale, where politics was always the conversation of the day. Glasgow was also the center of the temperance movement and political tensions were high! Kate’s older brother, Stuart, following in his father’s footsteps, was quite the visionary and saw through all these problems. One of his visions was how “tea” (up until now only afforded by the upper classes) could be an alternative to alcohol, afforded by all. Stuart set out to and had become a successful importer of tea. When customers would come into his shop, he would put the kettle on and offer them a sample. From there he decided to create a place where both men and women together (which was unheard of at that time) could enjoy tea and perhaps light sandwiches in a simple, clean, safe, pub-free atmosphere. This concept was so successful, he opened two more. Now enjoying great success, Stuart went on to buy one of the first covered shopping malls in Europe, Glasgow’s Argyll Arcade. Built in 1827, the Argyll Arcade housed many retailers and craft shops, but was beginning to be run down and in need of major repairs. Cranston was very focused in what he wanted in this row of shops, from uniformity of shop front designs and styles, to the quality of goods to be sold, as well as a very strict code of conduct for shop owners … which still applies today. Kate, following in the entrepreneurial spirit of her family, opened the Crown Luncheon Room in the Argyll Arcade. Although Glasgow was ranked as one of the richest cities in Europe, it also suffered from some appalling social problems … poverty, crime and disease. Kate’s father and her brother had taught her well because Kate was a force to be dealt with … not only on quality of tea and food, but on service and cleanliness. With the success of this luncheonette, Kate then opened Miss Cranston’s Tearoom in 1878 where she continued to place great emphasis on the details, from the decor and design, to her strict code on cleanliness, quality of food and service. Glasgow, in an effort to raise money for the city and showcase what Glasgow had to offer, opened The International Exhibition of 1888 at Kelvingrove Park (which attracted over 5 million visitors). Kate wanted to be able to offer exhibition goers a place where they could sit and enjoy a cuppa in a clean, safe and well organized atmosphere. She opened what is now a very popular concept, a “pop-up” tearoom. Like her brother, Kate was becoming quite successful. Kate was a bit eccentric at times, always defying social conventions. She dressed in Victorian crinolines, similar to what her mother might have worn, long after they had gone out of fashion. She’d also be seen around town dressed in a grey suit and bowler hat. However she dressed, she was a very astute business woman and although Kate married John Cochrane in 1892, she continued to be known as Miss Cranston of Miss Cranston’s Tearooms. After the success of her luncheonette and first tearoom, Kate opened a second, then a third and then in 1903, the one which was to become her most famous of all, on Sauchiehall Street. As a prominent businesswoman, Kate had become very well known in the artist community. This is where she had met the young Charles Rennie Mackintosh. Charles Rennie Mackintosh was born in Glasgow on June 7, 1868, one of eleven children. From the age of 9 he studied art and design, then trained as an architect in a local practice. At art school Mackintosh and his friend and colleague, Herbert MacNair, met sisters, Margaret and Frances MacDonald, also artists. Margaret was later to become his wife and worked with Charles on many of Kate’s projects. Frieze of woman in rose trellis. Kate first employed Charles in 1896 to provide just a stencil for the walls of her first tearoom on Buchanan Street. Mackintosh created a frieze depicting delicate elongated lines of female figures in pairs facing each other surrounded by roses. Kate loved it. She then gave Mackintosh more responsibility for the Argyll Street tearoom, where he created his first major piece of furniture, the elegant high-backed chair (now housed in the Hunterian Museum and Art Gallery). In 1900, working closely with Kate, Charles designed the ladies’ luncheon room for Miss Cranston’s Ingram Street tearoom. Then came the two-year Sauchiehall Street project. Mackintosh constructed a barricade around the building to protect his project, decorated with his classic stenciling and lettering, of course. Nothing escaped Mackintosh’s attention. He and his wife, Margaret, designed everything from the furniture and menus, to the silverware and the waitresses’ uniforms. Within this tall, white-washed four story building, Mackintosh created a casual tearoom for ladies on the first floor, with a tea gallery on the mezzanine level above it. On the second floor, he created a more exclusive ladies’ room, the Room de Luxe. Overlooking the street, this room had white walls with a frieze of stained glass and mirrored glass, stained glass double doors (Mackintosh’s largest and most elaborate stained glass creation) and his signature high-backed chairs in silver with sofas upholstered in rich purple. The third floor was to be a men’s billiard and smoking room. Sauchiehall Street was the “crown jewel” of tearooms. Kate’s defiant bohemian attitude was frowned upon by the ‘old order’. Her tearooms broke traditions. They provided a fashionable destination for women who were dissatisfied with their lot … where women and men were invited to not only dine together, but to play cards, billiards and smoke. She had created a place where, not only the elite could see and be seen, but where the artist community flourished. She encouraged young artists to showcase their talents by using her tearooms as galleries. Unfortunately, Kate’s husband, John, died suddenly in 1917 and Kate was no longer interested in the tearooms or in business in general. She sold her tearooms and wore black for the rest of her life. Kate developed dementia and became increasingly difficult to deal with. She moved from her fashionable mansion to a hotel in the south side of Glasgow where she was looked after by a female companion until she died in April 1934. Having had no children, when she died, Kate left two thirds of her £67,476 estate (20 times more than her brother Stuart) to the poor of Glasgow. Never actually receiving true recognition for his work, Mackintosh left Scotland with the hopes of living in Austria, where his work was admired. This was halted because of the outbreak of World War 1. He and Margaret moved to Walberswick, England, where he was arrested as a spy, possibly because of the letters he received from his friends in Austria. After being released they moved to London. As happens with so many talented artists, Mackintosh wasn’t recognized as the pioneer of modern architecture until the 1960s with the renewed interest in Art Nouveau and the Arts and Crafts Movement. It was only then that the art world recognized his talents. Charles Rennie Mackintosh died from cancer in London in 1928 – destitute. Miss Cranston’s Tearooms had become the places to see and be seen for Glasgow society and continued to be for many years. The partnership between Kate Cranston and Charles Rennie Mackintosh lasted for 20 years, the most important being the tearoom on Sauchiehall Street … now known as the Willow Tearoom. Today Charles Rennie Mackintosh is studied and celebrated around the world. Did I know any of this when we visited the Willow? Absolutely not! But it doesn’t take long when approaching the building to realize you’ve come upon a tearoom unlike any other. Yes, I know, everyone knows how to make a cup of tea. Right? Wrong! I am simply amazed at how many people make tea BADLY. The water is generally not hot enough, or too hot. If they use a teabag, it’s left in the cup or pot FOREVER! And these are the very same people who would never think of serving a badly prepared cup of coffee. A well made cup of tea is delicious. Please don’t offer me a tepid cup with a teabag hanging out. If you do, of course I will accept, but don’t be offended if I don’t drink it. Get a tea kettle or a saucepan, fill it with as much water as you think you will need for the pot or cup you are making. DON’T use water that’s been sitting in the kettle most of the day. The oxygen has dissipated and now it’s flat. Use freshly drawn water from the tap. Bottled water is not necessary. You don’t need any fancy appliance. By all means, if you have an electric kettle, use it, but if not, put the kettle or a saucepan on the stove. Please do not use a microwave. It’s just not possible to know what the temperature of the water is when using a microwave oven. And, if the water gets too hot, there is a chance the cup will explode. Yes, it does happen! The temperature you heat the water to is very important. If you use boiling water (210°) for green tea, you will stew the leaves and it will be bitter. If you use water that’s under the boil (180°) for black tea, it will be flat and insipid. When making black tea (English Breakfast, Earl Grey, etc. ), bring the water to a rolling boil. When making green tea (Jasmine, flavored or unflavored greens), bring the water to a soft boil and let it cool for a minute or two before pouring over the tea. It’s not complicated. Yes, I use a teapot every time I make tea. Do you have to use a teapot? No. But I truly believe it adds to the ceremony and enjoyment and taste. Using a teapot doesn’t mean you need to get Grandma’s old 6-cup porcelain pot from the back of the cupboard. Teapots come in all sizes and styles. In the morning I use a three-cup ceramic pot, perfect for making two large mugs of tea. Later in the day, I use my two-cup glass teapot, for an afternoon pick-me-up. Do you drink instant coffee? No. Then why would you use a teabag, which is nothing more than instant tea? Yes, teabag offerings have become much better recently. This is only because the large tea companies were losing market share as consumers started buying more and more loose leaf tea. As a result, these large tea companies had to step up their game to compete with the loose leaf tea market. Certainly you can use a tea bag if you’d like, but given the choice use good quality loose leaf. Don’t you deserve it? Use one teaspoon of tea for each 8 oz. cup. An 8 oz. measuring cup is not the same as a teacup. Teacups are usually 5 oz. Mugs are usually 12 to 14 oz. All the more reason to use a teapot for accurate measurements. A three-cup teapot uses three teaspoons of tea. What is the capacity of your teapot? Just get a measuring cup and find out. Green teas and white teas are lighter in weight than black teas. You may want to use a bit more green or white teas than a teaspoon. Black teas are heavier. You must want to use just a bit less than a teaspoon. Your taste will ultimately determine how much to use. Then put the tea into an infuser or directly into your teapot. Pour the boiling water (if it’s black tea – cooler than boiling if it’s green tea) over the tea. Cover and let it steep. This is also a critical point. You need to steep the tea long enough for the flavor to be extracted from the leaves. 30 seconds is plenty of time for a tea bag, but certainly not enough for loose leaf tea. For black tea, steep for 3 to 5 minutes. For green tea and white teas, steep for 2 to 3 minutes. Start with these times and then adapt to your own taste. If you like your tea steeped a little more, or less, adjust the steeping time slightly. But, please, remember you must take the tea bag or infuser out of the cup or pot at the end of the steeping time. Again, please remove the infuser or the teabags from the teapot or cup. Don’t leave them in the pot or your tea will oversteep and become bitter. Do you take milk and sugar with your tea? Feel free. Now relax and enjoy! Why am I writing about this company, which actually changed the face of Britain? Because I am frequently asked “If England never grew tea, how did tea get to England?” Well, here’s the answer. 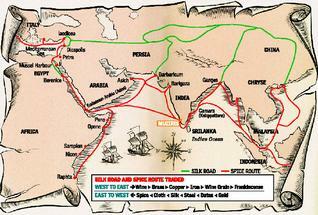 It all started with establishing the spice trade for Great Britain and the “John” Company ….. Spices had been known to man since the beginning of recorded time. 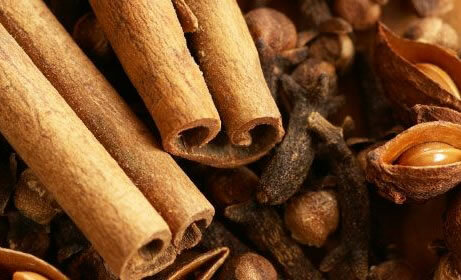 Pepper, cinnamon, clove, saffron, ginger and nutmeg are some of the oldest. Not only for preserving foods, spices made spoiled foods taste better, and helped make the ‘unwashed’ smell a little better. Spices were used for embalming the dead, in religious practices, and as medicine. Nutmeg, in particular was thought to be a miracle cure for the plague, which killed more than 35,000 people in 1603 in London. With spices grown primarily in Asia and the surrounding islands, the Indonesians were the first to begin selling their spices through what is now known as the Ancient Spice Route. This long and arduous journey began in Indonesia, traveled through China, India and the Middle East to the east coast of Africa and ended in the coastal city of Alexandria, Egypt. Alexandria thus became the central trading center for most of Europe. Needless to say, these much-in-demand spices became very expensive. 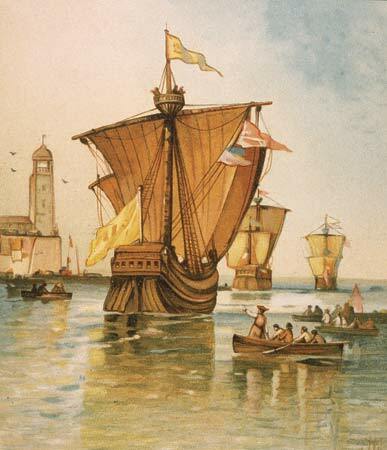 The Portuguese were the first to set their ships off to find the spice islands and by the 1400’s, they dominated much of the overseas spice route. It wasn’t long, however, before the Dutch and the Spanish went in search of these treasures. Who doesn’t remember the poem “In fourteen hundred and ninety-two Columbus sailed the ocean blue ….“? Columbus was, of course, searching for the spice islands, but, as we know, went a bit off course. By the 1600’s, however, these countries all had a stronghold in this area. The British East India Company, which was originally named the Governor and Company of Merchants of London Trading into the East Indies, but more commonly known as the “John” Company, was the brain child of London businessmen in 1600 for the sole purpose of importing these expensive and important spices from Asia, which was now dominated by the Portuguese, Dutch and Spanish. Led by James Lancaster, the John Company set off for Indonesia with five ships laden with linens, iron and lead to trade with the Indonesians. These items were of no interest to the leaders of these tropical islands. The Company continued on and finally ended up establishing trading posts in India where they bargained with tribal leaders and received exclusive rights to build factories. 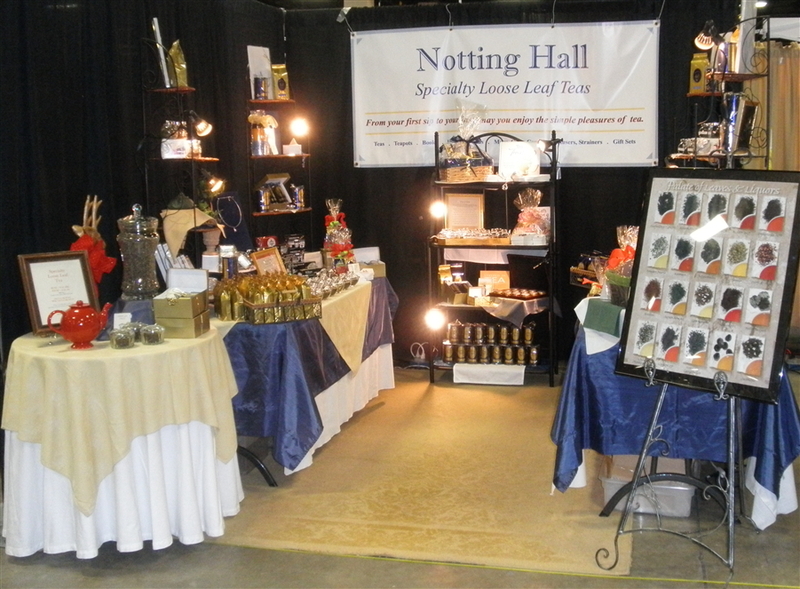 The Company brought back all sorts of exotic goods in addition to the spices … silks, porcelain, lacquerware, cocoa, tobacco, tropical fruits, sugar, coffee and tea. The Queen was delighted! Royalty and the affluent members of society were fascinated by these, before now, unseen treasures. Although these rich and powerful people knew very little about these other things, what they did know was that they wanted them … all of them! Trade wars began and because of their violent encounters with the Spanish, Dutch and Portuguese competitors, as well as with pirates, the “Company” found it necessary to create their own military and administrative boards, making them an imperial power. With this overwhelming power in place, the East India Company soon became the ruler of this massive territory. The Company continued building trading posts in India and continued to buy tea from the Dutch, because the Chinese would not trade with the English company. With the Dutch as the middleman, this made the tea even more expensive. The Company persisted. It took about 50 years, but finally they were able to negotiate a trade deal with the Chinese to purchase tea directly. Their first order was for 100 lbs. The demand for tea grew to the point where less than 100 years later the Company was placing orders for almost 5,000,000 pounds of tea each year! England was addicted. The Company was in full control now and was setting the prices. The Chinese wanted to be paid in silver bullion. At the beginning this wasn’t a problem for the British because silver was in great supply; but with losing the American colonies, access to South America, where the silver was mined, was becoming more and more difficult. Several decades earlier the Dutch had begun trading tobacco and opium with the Chinese – which the Chinese used mainly for medicinal purposes. The British, led by the Company, was now ruling over India and had established some opium plantations. They soon realized the answer to their “tea” problem was to increase their opium trade with the Chinese, ultimately leading to the Opium Wars. The Company would sell their opium to the Chinese at auction for silver; the very same silver that the Chinese were being paid for their tea. For the next twenty years, this trade was so lucrative that other trading companies wanted a share. Although China issued an edict that opium importing and consumption were illegal. The edict had no effect whatsoever. The Company, using smugglers and corrupt Chinese officials, continued to bring the drug into the country, using a technique still in practice today of giving away free samples. Interestingly, the term for accepting bribe money was called “tea money”. The British East India Company aka the “John” Company had grown into a very powerful political and trading monopoly which rivaled the British Government, and, in effect ruled many of the British Empire’s territories. It fought nations, set prices and taxed goods. (We’ll discuss the Boston Tea Party in another blog.) They had become too powerful and the British government sought to regain control. No longer was the John Company simply a commercial venture. It was now a political one. 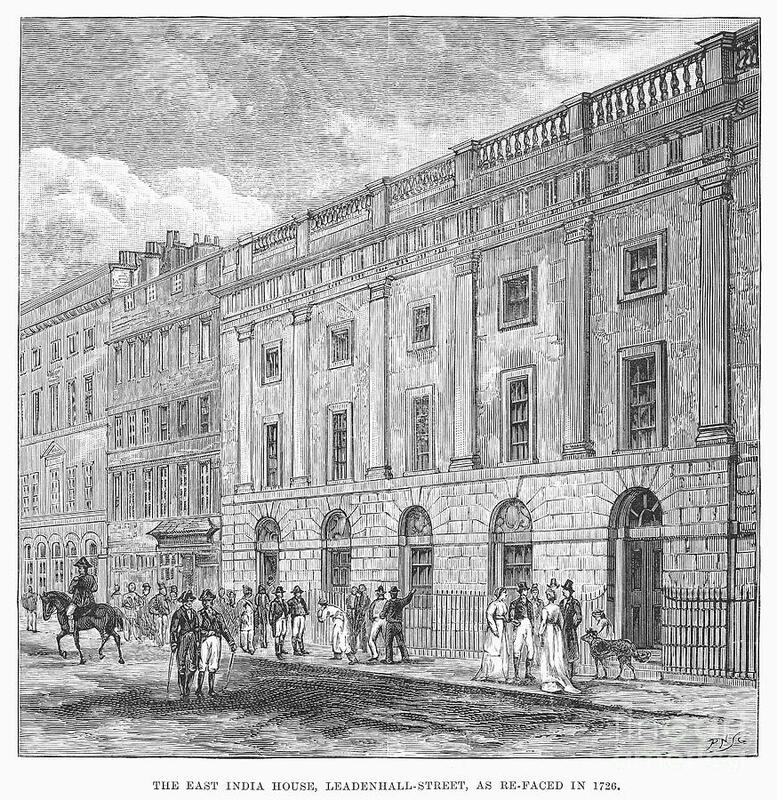 In 1834 the Company was finally dissolved and it was then that London merchants sprang into action. The first thing they did was to purchase as much tea as possible and as cheaply as possible. The timeline is England, late-18th century. Tea has found its way from the table of the aristocracy to the table of the every man. Gone are the days when tea was served to only men in English coffeehouses. 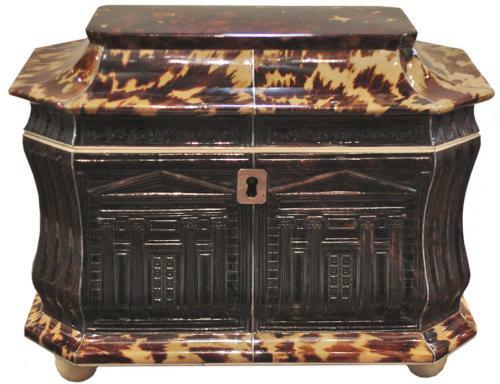 In the homes of the aristocracy, tea now is locked away in elaborately-carved wooden tea chests; the key kept safe by the “lady of the house” should the chambermaid, the footman or the butler decide to help him or herself. Tea now is also being enjoyed in almost every home, tea room and workplace. Maid servants are enjoying a ‘tea break’ twice a day … with an allowance taken from their wages to pay for the tea. Apprentices in manufacturing plants are allocated a parlor where they can have a twice daily tea break. Children in orphanages are given tea with milk and sugar. By the mid-1800’s, a professional man (doctor, lawyer) might earn £50 a year, while the average workman was only earning about 20 shillings a week. A live-in chambermaid might earn £5 per year, while the butler of the house would earn £20 . With Tea selling for more than £26 a pound, how was anyone ever going to afford this beverage? One word …. “smouch“. We might call it recycling, they called it “smouch“. Servants in the royal and affluent households, as well as workers in coffee houses, would take the used tea leaves and sell them through the back door to unscrupulous dealers. These “smouch” dealers would then add things like tree leaves, sheep’s dung and saw dust as fillers. They would color the leaves with iron sulphate, verdigris and copper. 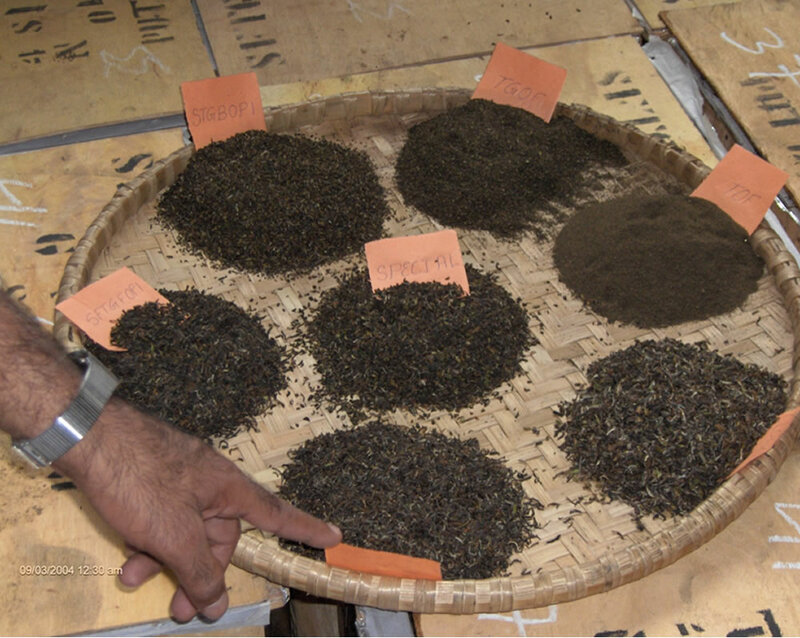 They would dry this mixture and then sell the “smouch” back to the tea merchants. It is believed that within an eight mile area, approximately 20 tons of “smouch” was manufactured every year. This flourishing underground market, in addition to smuggling, is what made it possible for tea to reach the commoner. and Window Act and on the Tea Trade, 1785”. The tea that was being imported from China and enjoyed now by all classes was green tea … not black tea as so many people associate with Great Britain. It was what we now refer to as “gunpowder” green tea. Black tea came about because the Chinese were becoming just as unscrupulous as the “smouch” dealers. The Chinese, knowing that people expected their green teas to have a bluish tint when steeped began adding gypsum to their tea just before firing the leaves, giving their cheaper teas the right color. Partly due to the fact that forests were being completely decimated in order to manufacture “smouch”, and due to the fact that poisonous dyes were being used, an Act of Parliament was passed in 1725 banning the mixing of tea leaves with any other leaves. This Act went completely unnoticed, which prompted another edict from the government in 1777 banning the sale of “smouch” altogether. Tea drinkers eventually became concerned about some of the more bizarre ingredients they were ingesting. When you think of all the copper, lead, gypsum and iron that people were drinking, sheep’s dung doesn’t sound so bad! The public became so concerned about these poisonous dyes, they began asking for ‘black’ tea … which is why black tea is the predominate tea enjoyed throughout Great Britain. And with smuggling so rampant at that time “smouch” was no longer an issue. So how about it …… would you like a little “smouch” with your tea? Not for “All the Tea in China” . . .
Who remembers this phrase? “No way, no sir, not for all the Tea in China!” That phrase was not to be challenged. You meant ‘no’ and you were standing firm. I believe the phrase began around the turn of the century. China was the largest producer and exporter of the world’s most popular beverage and everyone knew it. With more than 45 countries producing tea today, China still continues to produce more tea than any of the other tea-growing countries. They have, however, dropped to No. 3 in exporting. India, Kenya and Sri Lanka have taken over as the largest exporters of tea. These three countries alone produce the more popular CTC (crushed, torn, curled) grade of tea, which is blended and appears in your grocery stores as tea bags. But apparently India, Kenya and Sri Lanka are producing too much black tea because now there appears to be a glut of tea in the marketplace and prices are falling. It seems consumers (especially Millennials) are finally demanding higher-quality teas, green teas, oolongs and specialty teas. Who is drinking all this tea? According to Quartz, the biggest tea drinkers in the world live in Turkey! Which is amazing to me. I would definitely have thought it was the U.K. Having been to Turkey, I did not notice an overwhelming tea-drinking culture. Tea was served in restaurants, cafes, and always offered in upscale retail shops and tourist areas, but statistics don’t lie. They report that each person in Turkey drinks, on average, 6.96 pounds of tea each year, whereas a U.K. tea drinker enjoys 4.83 pounds each year. Could it be that in Turkey they use twice as much “tea” to make a cup? So how much tea does the average American drink? In 2014 Am ericans enjoyed over 80 BILLION cups of tea! But this research is also flawed, because Americans drink more ready-to-drink bottled tea than any other country, not to mention powdered tea-drink mixes. According to the Tea Market Report by the American Botanical Council tea-drinking Americans still prefer black tea – 84% drink black tea – while only 15% drink green and the remainder drink oolong, white, etc. The ready-to-drink, bottled tea market is huge today and negatively impacting the soft drink market. Sales of carbonated soda beverages have dropped steadily for the past nine years as consumers are choosing healthier alternatives in a ready-to-drink beverage. Chai concentrates are another way of enjoying convenient, prepared tea and are very popular. Another fast growing segment of today’s tea drinking society is actually not tea at all, but herbal beverages. (Yes, I know, everyone still calls it “tea”.) The herbal ready-to-drink market is also growing rapidly, with the most popular herbs being chamomile, ginger, echinacea, mint, dandelion and valerian root. But it’s not all about tea drinking. When was the last time you went into CVS or Target and noticed all the ‘tea-related’ products. Not only can you buy green tea concentrates and capsules to supplement your diet and help you lose weight, you can choose from a variety of green tea shampoos and conditioners. Green teas and white teas are incorporated into soaps and body washes, face and body creams. Have you tried green tea ice cream? It has been around for years and is delicious! How about Earl Grey-infused truffles? 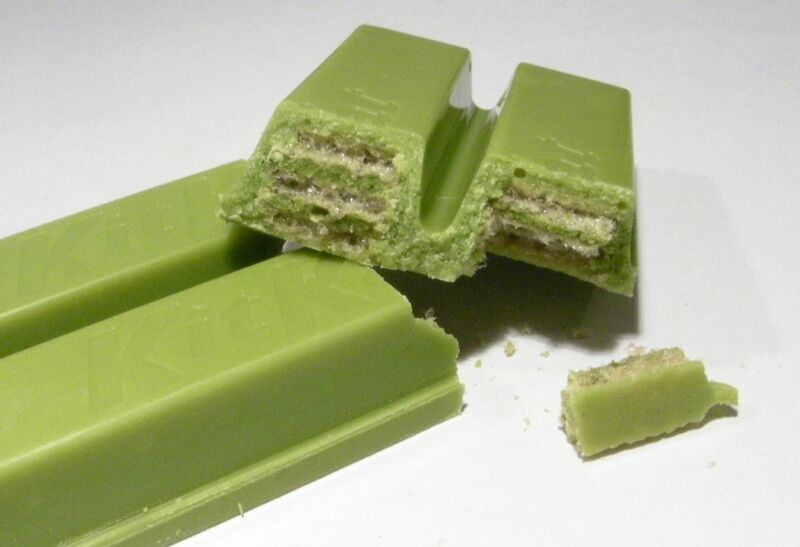 Matcha-infused KitKat bars? Not to mention Tea-smoked duck and Lapsang Souchong bbq sauce? 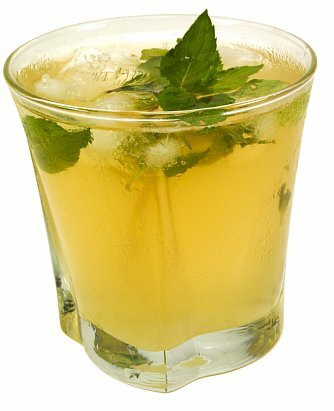 Mixologists in all the upscale hotels and restaurants are using tea concentrates in their cocktails. Tea-tini anyone? According to the Sterling Rice Group, a Boulder, Colorado-based communications firm, TEA is one of the top food trends this year. Chefs everywhere are incorporating TEA into their recipes. If you haven’t already, you’ll soon be seeing tea on menus in everything from appetizers to entrees. There are cookbooks now dedicated to using “tea” as an integral part of the recipe. CULINARY TEA by local chef Cynthia Gold is fabulous with over 150 recipes using “tea”. TEA COOKBOOK by Tonia George is another great cookbook using whole leaf tea in its recipes. Whether sweet or savory, tea is a versatile ingredient that can be used in many recipes …… and we haven’t even talked about how good it is for you! So jump on the “tea trend” and enjoy your tea. It’s not just about “All the Tea in China” anymore. It’s tea anyway you can get it! * These figures are lower than the overall high production of 2013. The Natural History Museum in London has just uncovered a box of tea …. how uninteresting you’re thinking …. except this small cardboard box with the glass lid has been sitting in the basement of the museum lying among other ‘botanical collections’ for more than 300 years! The dried tea leaves found in London’s Natural History Museum. Labelled “a sort of tea from China” it is believed this tea was donated to the museum by Dr. Hans Sloane in the early 1700’s. But where did it come from and why was it donated to the museum? A Scottish surgeon employed by the British East India Company, James Cuninghame, is best known for being a passionate botanist, and an extremely unlucky one at that. During his trips to China and Southeast Asia in 1698 and 1705 with the trading company, he was able to collect and send back to Britain over 600 Chinese botanical specimens. Among his many samples were leaves from the Camellia Sinensis plant, both on the branch and processed. At that time, western traders were limited by the Chinese to the ports on the island of Zhoushan, and Canton (now known as Guangzhou). 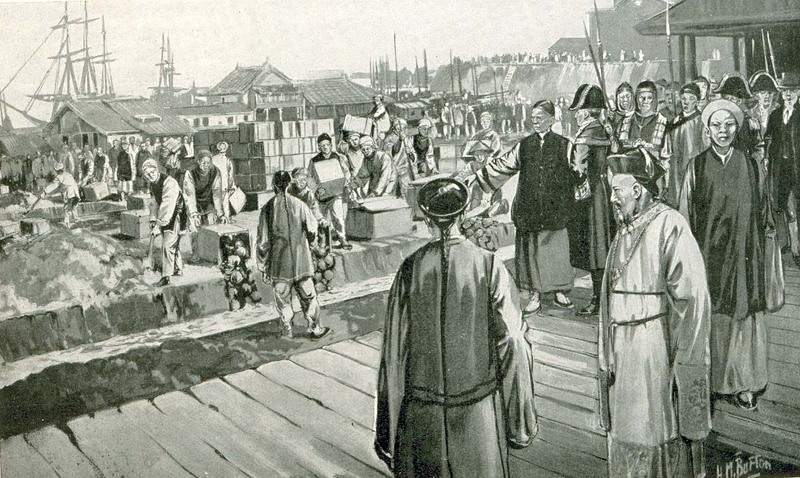 In 1703, the Chinese forced the closing of the Zhoushan trading settlement, which was subsequently moved to an island off the coast of Vietnam. Driven by the spice trade since the early sixteenth century, this was a very important multi-ethnic port, with populations of seafarers, explorers and tradesmen. Commercial revenues were strong and in return patronage and protection were given. But on March 15, 1705 Malaysian soldiers, hired to protect the trading settlement, rebelled and set fire to the settlement, killing sixteen men. The survivors turned to the local authorities for help. Help came, but shortly after capturing and executing the Malaysian soldiers, they also turned against the English. Only Cuninghame and a few others survived. In a letter dated May 4, 1705, Cuninghame provided a personal account of his treatment and trial following these traumatic events. Appearing before officials, he was made to answer charges against the English. His defense failed to impress his captors and he was held captive for another two years. Following his release, Cuninghame’s misfortunes continued. He narrowly escaped yet another massacre in Borneo and eventually died in 1709 on a voyage from Bengal to England. 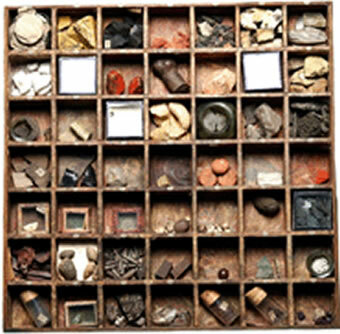 Sample box of Sir Hans Sloane (1660–1753), from the British Museum. During his trips, Cuninghame corresponded with an even more passionate plant collector Dr. Hans Sloane. Dr. Sloane is actually credited with introducing England to another very popular brew – drinking chocolate. Sloane discovered that by adding milk to ground cocoa beans, the bitterness was reduced, and made the cocoa drinkable. Like tea, chocolate was first promoted for its medicinal value. 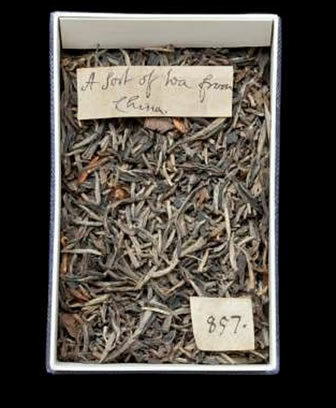 Among the botanical specimens that James Cuninghame sent back was this sample box of tea. Dr. Sloane labeled it #857 and cataloged it in his herbarium among his “vegetable substances” collection. His collections grew so vast they became the basis for the botanical studies of both the British Museum and the Natural History Museum, which is where “a sort of tea from China” ended up. Historians from the Queen Mary University of London, who are doing research for an upcoming book, were able to identify the sample as the oldest physical remnant of Britain’s favorite drink – TEA! I know I’d love to give it a taste. How about you? It’s the late 1600’s and people are asking “What is this fine, white porcelain that is coming in from China on the tea boats?” Crates of this porcelain is being offloaded from the ships and stacked on the piers. But, what is it? What is it for? These crates would be stacked on the bottom of the hold in the ships to provide ballast as well as to provide a dry floor for the tea crates to sit on. 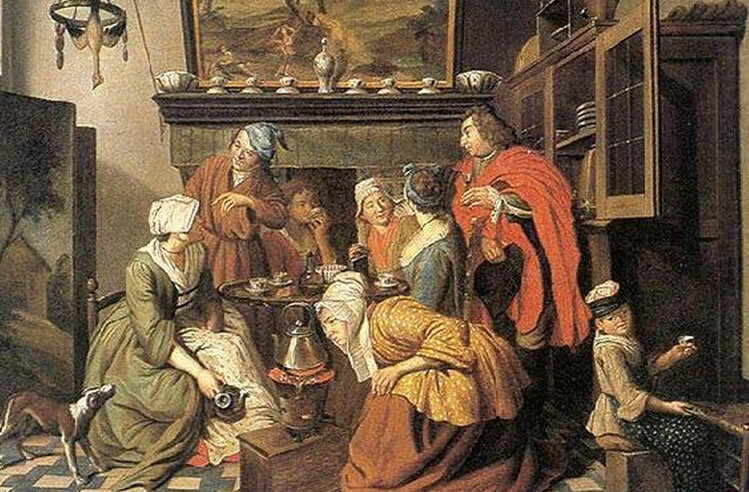 Although the Dutch East India Company did not import these items at that time, the ships’ captains realized their value to the newly-enamored, wealthy tea drinkers and began profiting from their sale on the black market. As early as 1530, fine Chinese porcelain in the form of vases, figurines and bowls were given as gifts to the Aristocracy (and are still on display in various museums around the world). Exotic items such as ostrich eggs, Turkish and Russian pottery, and Chinese porcelain were among Queen Mary’s and then Elizabeth’s most prized possessions. 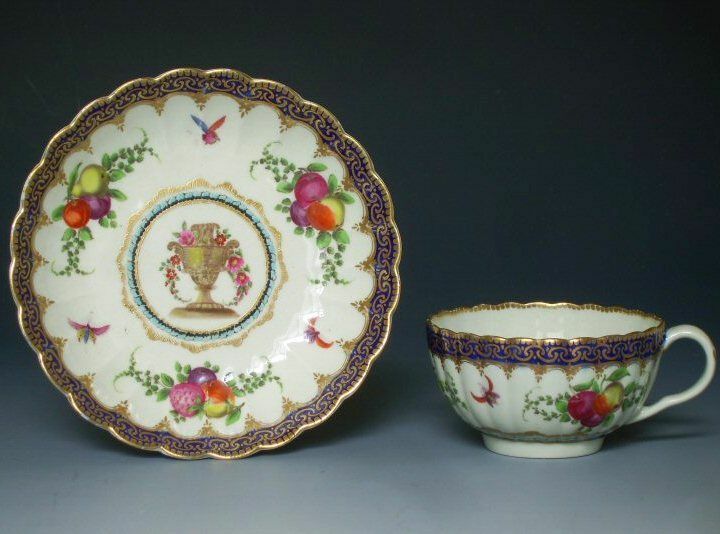 The delicacy of fine Chinese porcelain was valued and appreciated over the rough, heavy British earthenware. In 1724 in “Tour Thru the Whole Island of Great Britain” Defoe wrote, “The Queen brought in the custom, as I may call it, of furnishing Houses with China-ware….piling their China upon the tops of cabinets, structures and every chimney piece.” China-mania had begun!! By the end of the 1700’s most of Europe had obtained a few pieces of this fine “China” and the practice of displaying these luxurious pieces came into play, hence the “China closet“. Louis XIV was so enamored of this decorative tableware he ordered a complete set consisting of hundreds of pieces. Although a few other colors were imported from China, it was the very popular blue and white porcelain bowls, pots and cups that were the most popular. 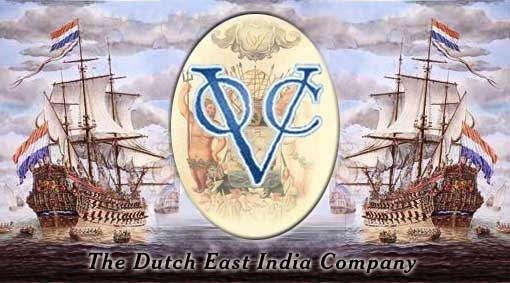 The Dutch East India Company was now the sole importer for everything from the East, and as a result, all imports came through the ports in Holland. Dutch potters, observing the demand for these items, became inspired and began to create their own pottery, which became known as Delftware. Colors, patterns and designs were copied directly from the Chinese, but slowly European images began to be used …. windmills, fish, swans, etc., and the first of new shapes took form. The best known was the creation of the “plate“. English potters were desperate to create this fine white porcelain. European potters had created a soft porcelain made with white clay and ground glass. But how to create a hard porcelain that would stand up to the heat requirements of tea? It was discovered that the ashes of calcined bones could act as a strengthening agent in the paste. This then became known as fine “English porcelain” now identified as “bone China“. The development of the pottery district in England came after bone China was perfected. From Davenport to Spode to Minton to Wedgewood, most of the successful potters located in the area of Stoke-upon-Trent. I’ve seen other blogs which credit Robert Adams as the inventor of the tea cup handle. Unfortunately, I’ve never found any documentation to support that theory. Handles on tea cups came into use as soon as the Chinese realized that Europeans drank their tea much hotter than they did and in larger ‘bowls’. Handles started appearing on ‘tea bowls’ as early as the 1700’s. It was quite common before then to simply pour the tea from the ‘tea bowl’ into the accompanying saucer to cool, and then to drink from that. After tea cups had handles, it was deemed only the lower class would ever drink from the saucer. Needless to say, “tea” and “tea equipage” at this point in history was only for the upper classes. 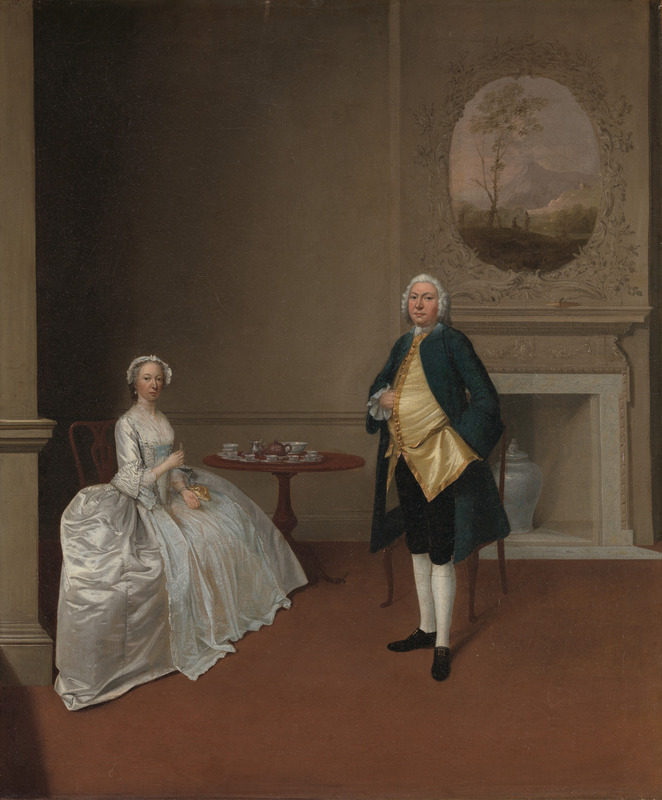 A London magazine in 1744 noted, “it could cost more to maintain a fashionable tea table, with its expensive tea and utensils, than to keep two children and a nurse.” Despite this expense, tea continued to play an essential role in the social life of the British and the world. During my 15 years of tea lectures, exhibitions and shows where I’d present information about tea’s origins, types of teas and their unique properties, classics vs flavored, health benefits, steeping instructions, folk lore and traditions, inevitably at the end of the presentation someone would ask me if I sold “orange pekoe” tea. Aghhhhhhhhhhh! I have Estate teas, Chinese Keemuns and Yunnans, Kenyan teas, Darjeelings and Assams, teas from Sri Lanka and Nepal – all grades! I have English Breakfast, Irish Breakfast, Scottish Breakfast. I have blends with Assams and Darjeelings. I have blends with Keemuns and Assams. I have blends with Keemuns, Ceylons and Darjeelings, but, no, they want that “orange pekoe”. I loved my customers and I appreciated each and every purchase. If they were interested, I really did try to give them a bit more information. A knowledgeable customer is going to make a more educated purchase (hopefully). But, how has this name, Orange Pekoe, become synonymous with good quality black tea (and, yes, despite my attempts to educate otherwise, some people do believe it is orange flavored). Let’s start at the beginning. Tea originated in China. But it was the British industrialists who began to capitalize on the burgeoning tea market. 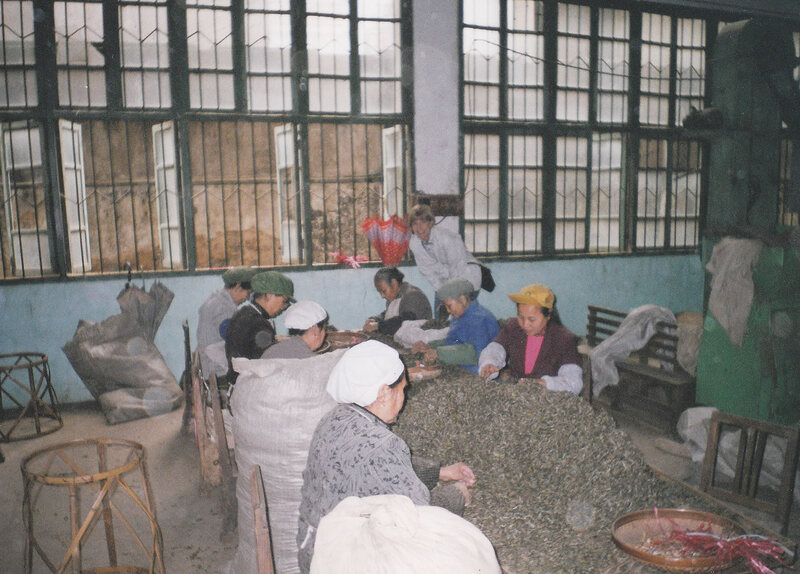 In China, after the tea leaves are plucked, they are withered naturally, rolled and shaped by hand, wok fired and then sorted for size and quality. Sorting Room in Chinese Factory. This was far too slow and time consuming for the British industrialists. It wasn’t long after the British established plantations in India and Ceylon (Sri Lanka) before these innovators created machines to do this work. Heated tables for withering were invented. Rolling machines were invented. But having machines do the work created another problem. The whole leaf was now broken into particles which required a process to ‘sort’ the different leaf sizes. This led to a process of using fine screens (much like window screens) of various sizes to separate out these particles by size. Now there was a need to have a standardized sorting or grading system, which would identify the leaf by its size. With every solution came another problem. A grading system had to be created. Oops, did I say “O = Orange and P = Pekoe”? Could it be that “orange pekoe” is a grade or size of tea, such as “tippy golden”? BINGO! Let’s start at the top of the list, assuming SFTG was probably the best ‘grade’, wouldn’t BOP be the lowest? Hmmmm. This doesn’t necessarily mean this tea wouldn’t taste good. It does mean, however, that it was/is the lowest grade of tea. All the letters seem to have a logical description for a leaf … “special”, “fancy”, “tippy”, “golden”, “flowery”. But “orange” and “pekoe” … where did these strange terms come from and what exactly do they mean? A Chinese belief is that the tea was originally scented with orange blossoms, hence the use of the word “orange”. Plausible but highly unlikely. A more likely explanation is the term “orange” refers to the Dutch royal House of Orange-Nassau. Tea was first brought to Europe by the Dutch in 1675 and it is believed that the Dutch tea traders coined the term to imply a higher classification of tea, suitable for their nobility. The term “pekoe” (which is pronounced peck-o and not peek-o) could be derived from the mispronunciation of the Chinese words for “white hair” which are “bai hao”. “Bai hao” refers to the downy-like white hairs on the leaf just below the bud, which would be the bai hao leaf or in pidgin English, the pekoe leaf. The next size down from the pekoe leaf would be the orange leaf; then the souchong leaf. The more mature the leaf, the less flavor the tea would contain. As a result, a fine plucking would consist of the unopened bud, or tip, along with the next leaf or two leaves, resulting in “orange pekoe”. After processing and sorting the leaves, you might end up with BOP, FOP, GFOP, TGFOP, FTGFOP or even SFTGFOP. The more letters, the better the grade of tea. All this can be quite fascinating or painfully boring to you. The real question is how did the average tea lover get to believe that ‘orange pekoe’ tea was the best tea on the market? For that we have to look at that Scottish marketing genius, Thomas Lipton. 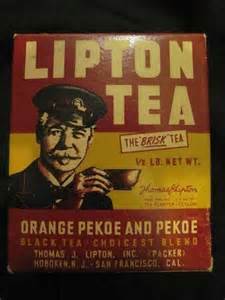 It was 1850, and although still very expensive, Great Britain and the new Americas were now consumed by tea, and Thomas Johnston Lipton is born. The youngest of five children Thomas Lipton was born in Scotland to Irish immigrants. Although not an academic, Thomas learned his three R’s and looked to move into the business world for his future. After a few failed encounters, Thomas found a job he loved, working as a cabin boy. This love of water and ships would continue throughout his life. 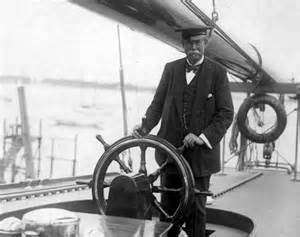 Saving his money, at the age of 15, Lipton booked steerage passage on a steamship bound for New York. A few directionless jobs later, Lipton managed to secure a position as assistant at a successful grocery store in New York City. He was fascinated by American advertising and marketing and by how different American grocery stores were compared to the British stores. Back in Glasgow, Thomas’ parents had opened a small grocery shop. After three years in NYC, at the age of 18, Thomas now returned to Glasgow to work in his parent’s shop. It didn’t last long because he wanted to replicate the NYC grocery store he had worked in. Two years later, Lipton opened his own store. Preferring to deal direct with the producers of the food, and not the middlemen, Lipton was soon buying direct from farmers. His Americanized concept along with eliminating the middleman was successful. It wasn’t long before he had opened many more grocery stores and with the opening of every new store, Lipton would create outrageous advertising campaigns. One Christmas Lipton announced that his cheese would contain sovereigns (about 20 shillings or half a one pound note) and half sovereigns. When the cheese went on sale, within two hours every last piece of cheese was sold. These cheeses became so large and so much a part of Lipton’s annual Christmas displays that the manager of Lipton’s Nottingham shop hired an elephant to transport the cheese through the town. Vintage advertisement for Lipton Ceylon Tea. With over 300 stores, Thomas now decided to turn his attention to tea. 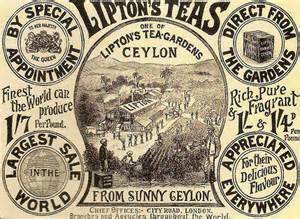 Continuing with his theory of cutting out the middleman, Lipton decided to visit plantations in Ceylon (Sri Lanka) and learn the process himself. This was the time when the coffee blight struck the coffee plantations in Ceylon and the coffee crops were wiped out. Within a short period of time, Lipton scooped up five defunct coffee plantations and created tea gardens …. thus becoming the grower, the producer, the middleman, the wholesaler and the retailer! Lipton was masterful, he made his tea affordable to everyone. He did not stop with just selling his tea in his own shops, Lipton distributed his tea everywhere, exhibiting Lipton Teas at the London and Paris world fairs, continuing his relationship with American grocers, and opening corporate offices in Hoboken, NJ. “Direct from the tea garden to the tea pot.” Who wouldn’t want the freshest tea possible? Soon the famous goatee and captain’s hat became associated with good quality tea and was found in cupboards all around the World. And what could he call his tea to make it seem as if it was the best quality available ….. how about calling it “ORANGE PEKOE”. References: Liquid Jade by Beatrice Hohenegger, Mitchell Library, Harney & Sons Guide to Tea, Wikipedia.